IS DAWN THE BEST TIME TO FISH? 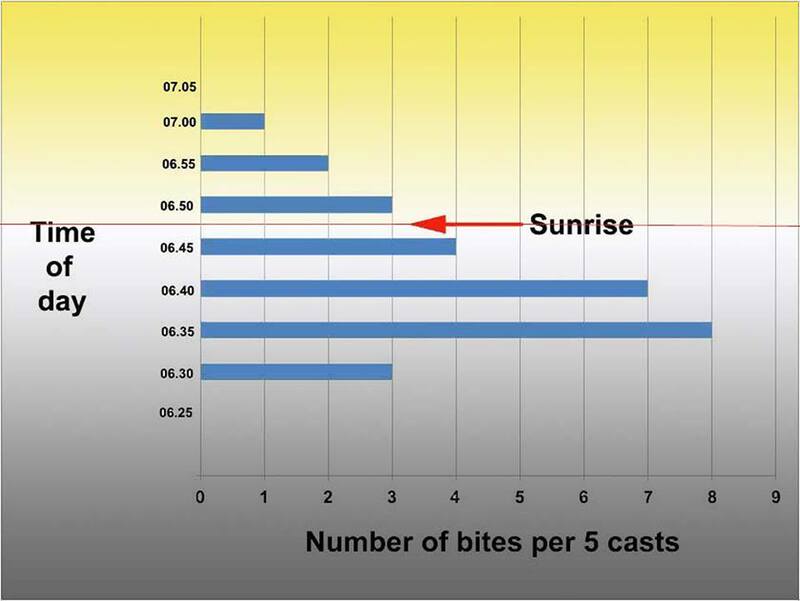 Recently I received a fascinating e-mail from Dr Mike Ladle in the UK describing his experiment to see whether fish activity increased around dawn. Mike is convinced that fishing at the change of light at dawn is the most productive time of day and designed an experiment to try and prove this. “I’m crackers – I know that. I often fish first thing in the morning. Getting up in the early hours to go fishing is not everyone’s cup of tea so why do I do it? I get my fair share of emails telling me how other anglers catch plenty of fish both at night and in the daylight hours so why do I persist with my dawn and dusk approach to fishing? I’ve often written about the theory of why predatory fish feed best at the change of light etc. etc. but clearly many people are still not sufficiently convinced by the science to drag themselves out of bed. This week I decided to try and prove my point. Logging a normal fishing session is no use because I would spend valuable fishing time playing, landing and returning fish, the wasted time would distort the results. Clearly this had to be avoided so I took the hook off my little wedge and replaced it with just a bit of shiny fluff. To record the results I drew up a table on a sheet of A4 so that I could record how many bites I had on each cast. Down to the coast I went, well before sunrise, armed with my hookless lure and my clip board (I told you I was crackers). With the clip board, the pencil and my watch on the rocks behind me I began to cast and retrieve. Every cast went in the same direction and was wound back at the same steady pace. Each time the lure was lifted from the water I filled in a box on my chart with the number of bites on that cast. It was mind blowingly frustrating knowing that however active the fish were I wasn’t going to catch anything. I know that the place I fish normally produces, pollack, mackerel and bass, often in that order as it gets lighter but in this case they were just ‘bites’. I’ve not gone to the experimental lengths that Mike Ladle did to determine whether there is a similar pattern of dawn fish activity in NZ but anecdotal experience would suggest that it does. I’ve lost count of the number of times that I’ve been fishing at dawn and seen big predators, particularly snapper, kingfish and smooth hound sharks, cruising in calf deep water hunting for unsuspecting prey. Below are two videos showing precisely what I am talking about. What I have noted though is that fish activity seems to be linked to low light angles and that the predators generally attack with the sun behind them. No doubt their prey is temporarily blinded by looking into the sun and the predators exploit this momentary weakness to the full. The lower the angle of the light the better. 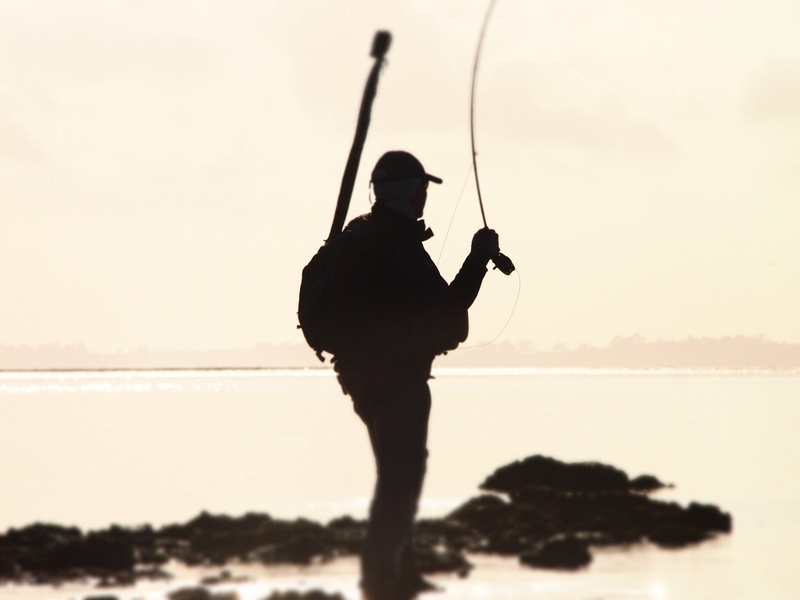 Kingfish around Auckland often head into the shallows at first light to hunt small flounder. They head in with the sun at their backs and force the small flounders to the surface. Once there the flounder stand no chance as they are silhouetted perfectly against the lightening sky. One kingfish we landed in late summer had four tiny flounder inside its stomach, three that were four centimetres long and a ten centimetre specimen. Snapper do the much same thing around dawn heading into the shallows in search of easy pickings. In the picture below I am casting to an estimated 7 kilogram snapper that is tailing as it is feasts on small crabs and shellfish. When you suddenly see a tail the size of a hearth shovel waving at you it is hard to keep your composure. Flats fly fishing does not get more visual or exciting than this! Another thing that I have noticed is that if an estuary is shaded from the early morning sun by a peninsula or headland then the predators will not start to move until the sun rises high enough to clear the headland and start warming the shallows. This phenomenon is more evident when the morning is cold, particularly if there is a frost. As the sun starts to shine on the margins and the water and air temperature both begin to warm there is often an intense period of predator activity. 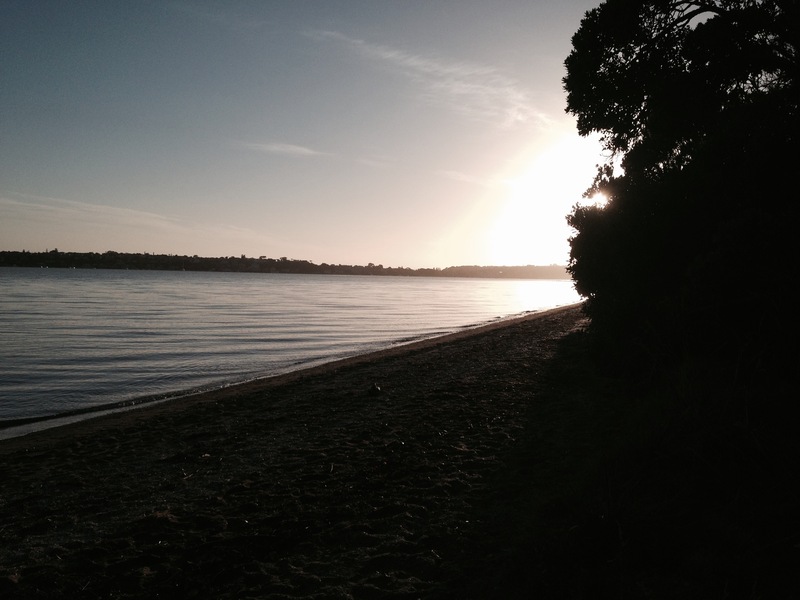 On the Manukau I’ve seen several massive kahawai pack attacks in the first hour after dawn but only once the sun has started to finally shine on the water. 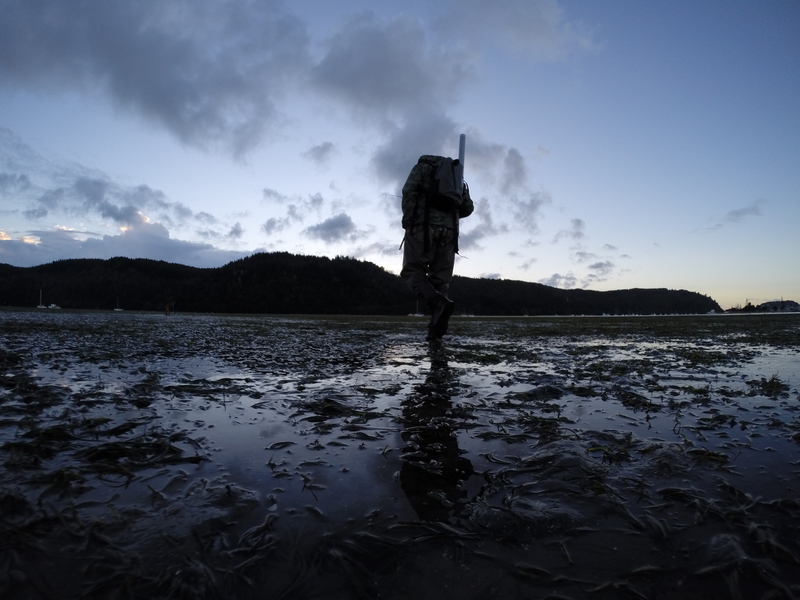 Early morning is a fantastic time to head onto the flats. The birds are preoccupied chortling in the dawn chorus, the water is glass calm, steam tendrils rise from the margins and it is as if time is standing still. That is until the reverie is disturbed by a double figure leviathan hurtling shoreward after its breakfast. Give it a go. It is addictive.